Canada geese goslings and pelicans. 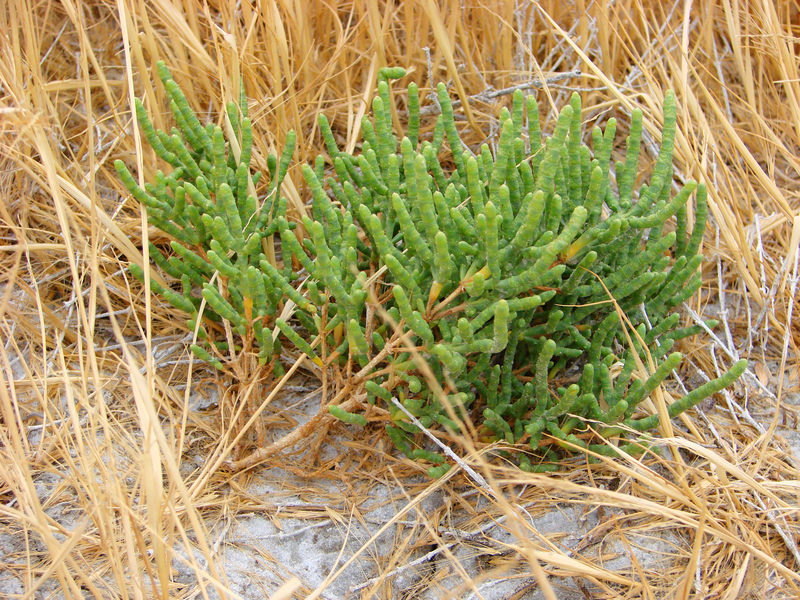 is adapted to growing in saline soils. A wetland really is more than just ‘land that is wet’. There are certain key ingredients that need to go into a wetland for it to truly be a wetland. 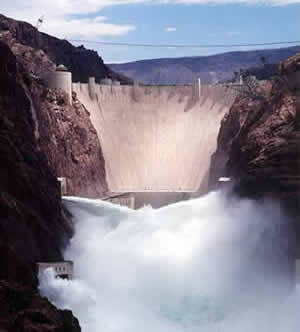 Of course, water needs to be present for at least part of the growing season. It can simply be in the form of temporarily saturated soils or even standing water a few feet deep. As soil becomes saturated with water, oxygen levels are greatly reduced. Quite often, bacteria in saturated soils will create hydrogen sulfide, giving wetland soils that stinky odor of rotten eggs. As plants grow in a wetland over several years, their decaying matter helps to create a thick, dark layer of organic soil. The presence of water in a wetland encourages the growth of hydrophytes, or ‘water-loving’ plants, that are specially adapted to living in wet environments. Many wetland plants have open spaces within the leaves and stems- often referred to as aerenchyma. This allows oxygen to diffuse down to the roots, sometimes creating an oxygen-rich environment in the soil around a plant. Also, many wetland plants reproduce both by floating or wind-dispersed seeds and by rhizomes, which are underground roots that can travel great distances. Some plants that grow in salty wetlands around Great Salt Lake are able to control the salt in their tissues by depositing it on the outside of the leaf or containing it in chambers within their cells. Like plants, specially adapted animals also call wetlands their home. Mammals and birds have oily fur or feathers that allow them to swim in cold water without losing much body heat. They also often have webbed feet to aid in swimming. Other animals, such as fish, amphibians, and insects, have gills to breathe in water. 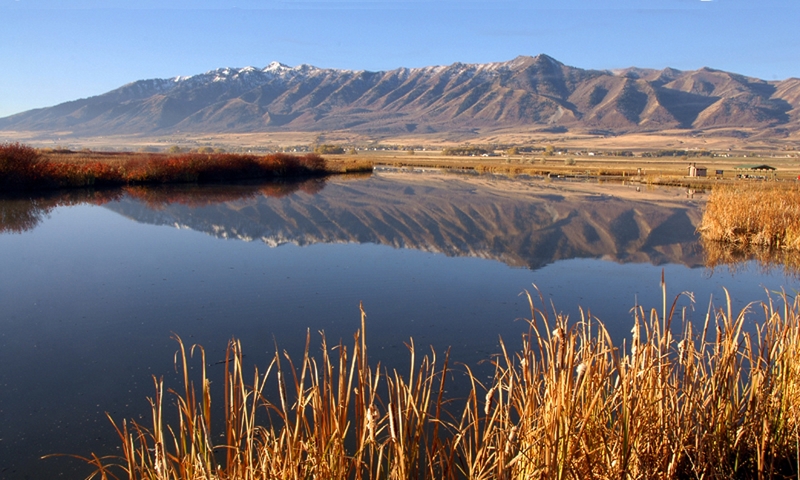 Despite being the second driest state in the country, Utah has a high diversity of wetlands. 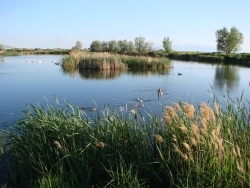 Vast marshes surround the Great Salt Lake, providing habitat to enormous populations of migratory birds. Less obvious wet meadows provide unique habitat to butterflies and other insects. 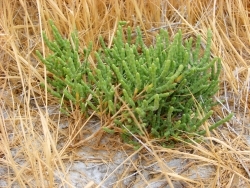 Salty playas which are shallow basins with no outlet, are found throughout the West Desert, creating unique ecosystems of highly adapted plants. Riparian wetlands can grow along the edges of rivers, providing a unique transition between the swift water and upland habitats. Southern Utah is home to some peculiar wetlands such as potholes and hanging gardens, both associated with sandstone bedrock. A hanging garden clings to the side of a moist cliff, creating a microhabitat for rare plants, such as orchids and monkeyflower. Potholes can simply be eroded basins in the sandstone where water collects in spring. A pothole is an oasis that provides water for desert wildlife and a home for fairy shrimp and spadefoot toads. Spring is the perfect time of year to visit a wetland. The constant chorus of birds, insects, and amphibians are a testament to the importance of wetlands, teeming with life in the middle of a desert. 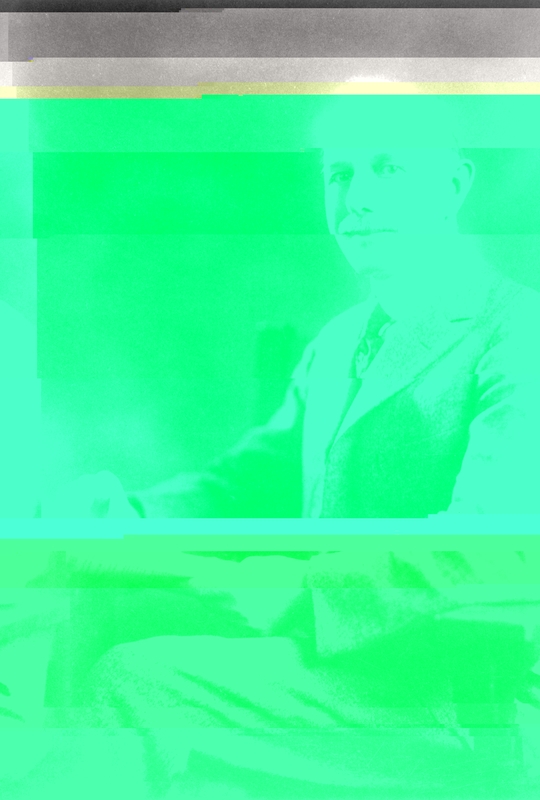 Mitsch, W.J., and J.W. Gosselink. (1993). Wetlands. Van Nostrand Rheinhold. The onset of springtime brings nesting birds in abundance. In the past week alone, blackbirds have been defending their territories in the marshes, goslings can be seen trailing behind their parents, and swallows are swooping and perching near their nests. One bird that is impossible to ignore is the killdeer. Its call is loud, and easily recognizable. Licensed under Creative Commons Attribution-Noncommercial-No Derivative Works 3.0 United States License] It’s no coincidence that its scientific name is Charadrius vociferous. 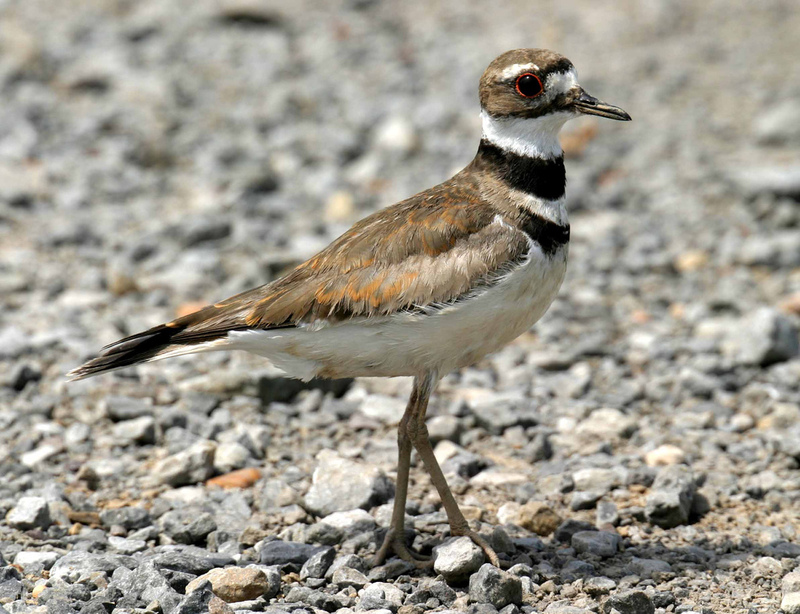 Killdeer are a type of plover, similar to the snowy plovers that nest along the shores of Great Salt Lake. 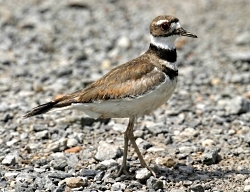 The killdeer, however, is well at home in dry upland habitats. The most peculiar characteristic of killdeer is that they are often seen and heard in the most unlikely of places- dirt roads, parking lots, or even construction sites. Killdeer nest on open ground, digging just a shallow scrape in the soil. 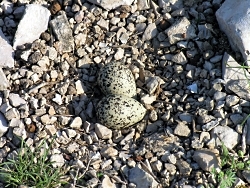 Gravel roads are often ideal nesting habitat because killdeer eggs blend in well with nearby pebbles. The spotted eggs and young hatchlings are very cryptic, invisible to the eye even when they are underfoot. This dangerous breeding strategy can often lead to trampled nests. Or, if a predator has a good sense of smell, the eggs and young are easily eaten. Although, the killdeer has a trick up its sleeve (well… its wing)! When a predator, such as a fox, approaches the nest, the adult killdeer feigns a broken wing while walking away from its nest. This draws the attention of the predator, which thinks it’s found an easy meal, away toward the adult. Once it’s led the threat far enough from the nest, the adult killdeer takes off in flight, taunting the predator with its call. It’s very hard to see a killdeer nest even when it’s obvious the adults are near it. Keep in mind, though, that time spent looking for a killdeer nest is time that the adults are not tending to the eggs or hatchlings, which puts their survival at risk. A bird that lives so dangerously can use all the help it can get. Tekiela, S. 2003. Birds of Utah. Adventure Publications, Inc. Cambridge, Minnesota. Warm springtime weather brings clear trails up in the mountains, and hiking through the shade of Douglas-fir on a warm weekend day had me wondering about Utah’s National Forests and how they came to be. Back in the days of the early pioneers, Utah’s mountains were recognized as resources for survival, providing clean water for drinking and irrigation and lumber for building homes. The high mountain pastures were also valuable summer forage for livestock. In the late 1840’s, Parley Pratt declared, “The supply of pasture for grazing animals is without limit in every direction. Millions of people could live in these countries and raise cattle and sheep to any amount.” Many settlers shared this view, and unmanaged grazing resulted in deteriorated rangelands in just 20 to 30 years. 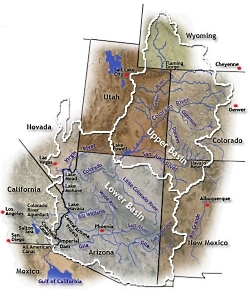 By 1860, some Utah towns were experiencing regular flooding and heavy erosion due to insufficient vegetation to stabilize the soil. Unregulated wholesale timber harvesting during the same period also contributed to these conditions. 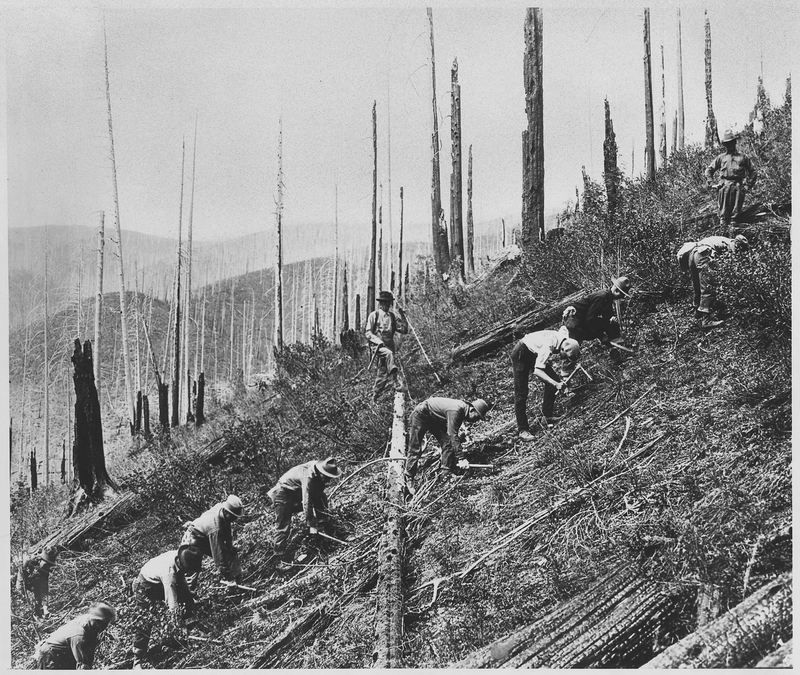 The demand for lumber and wool during the First World War again led to increased timber harvesting and grazing on our forests. During the Great Depression of the 1930’s, Franklin D. Roosevelt established the Civilian Conservation Corps (CCC) to help implement conservation projects across the country. 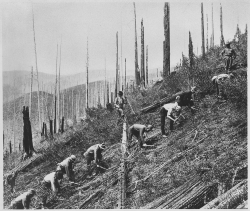 The CCC was fundamental in re-foresting much of the Wasatch and Uinta Mountain ranges, planting over three million trees in nine years. 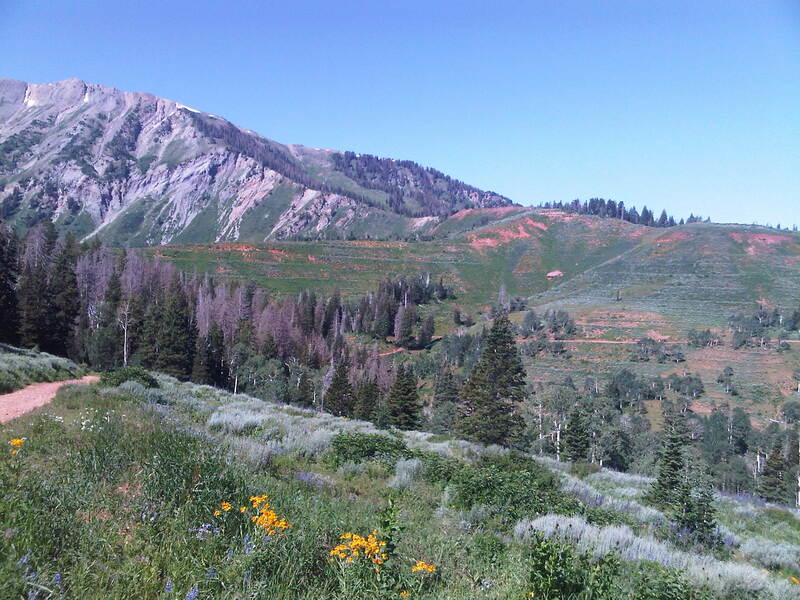 Utah’s Forest Reserves were created in the years soon after Albert Potter’s surveys, and were gradually combined into Utah’s seven National Forests that now cover approximately 10,500,000 acres, or about 20%, of the state. 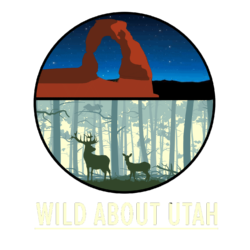 Grazing and timber harvesting still occur on much of Utah’s National Forests, but our practices are supported by scientific research and over a century of experience, ensuring more sustainable multiple use and management of our forests today. 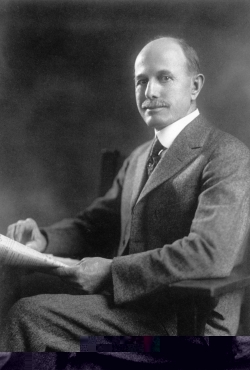 Baldridge, K.W. The Civilian Conservation Corps in Utah. Utah History To Go.